Ecological stoichiometry considers how nutritional needs of organisms for basic body-building molecules shape their ecology. It asks how nutritional demands of organisms and supply of nutrients in their environments affects organisms growth, their interactions with the biotic and abiotic worlds and nutrient cycling in whole ecosystem. The quality of food resources is crucial for animal growth, development and population dynamics. Therefore, limitations are posed on organisms because of food scarcity in specific nutrients. These limitations may shape ecological interactions and affect cycling of nutrients in the ecosystem. 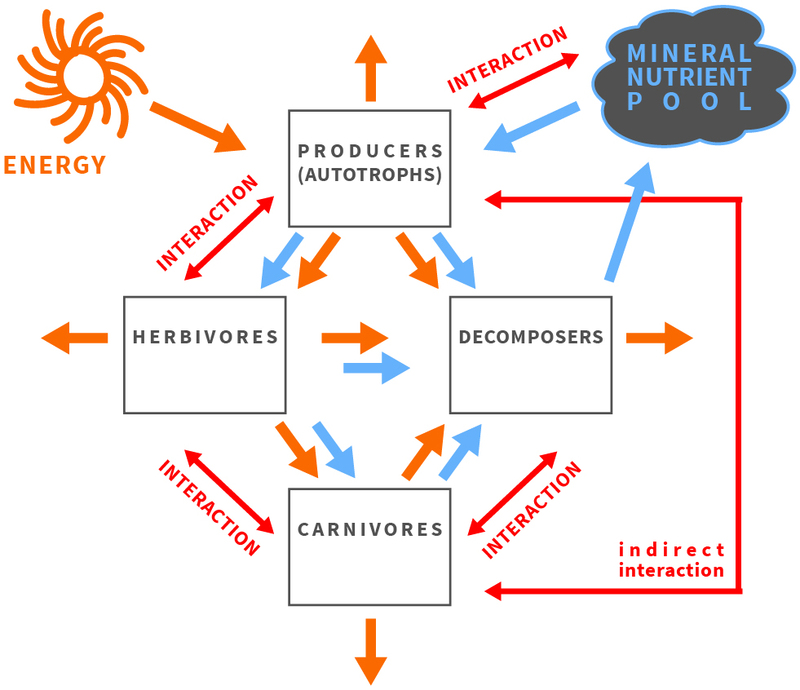 To better understand nutrient cycling driven by nutritional constraints posed on organisms, their communities and populations the ecological stoichiometry framework was developed (Figure 1). This research framework capitalizes on organisms to be composed of identical building blocks - atoms of chemical elements - even though they build remarkable diversity of organic molecules having diverse functions [1–3]. During growth and development organisms assimilate all the building blocks needed to compose the adult body. The body is built of atoms in taxonomically specific proportion known as the organismal stoichiometry . 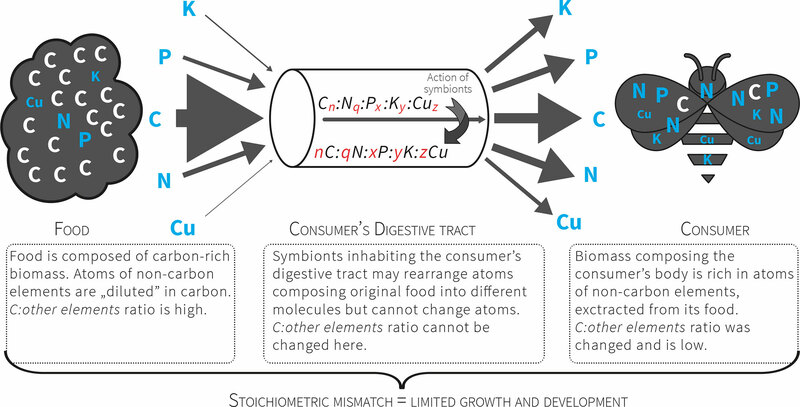 The demand for resources gathered during juvenile growth is reflected in organismal stoichiometry of adult body and stoichiometric mismatch (Figure 2) may occur between the atomic composition of the body and food . Even toxic effects may in fact be caused by such stoichiometric mismatch rather than true toxic substances . The framework of ecological stoichiometry was envisioned in the works of Wiernadski [5,6], Liebig, Playfair and Webster , Lotka , Tilman  and Reiners ; postulated explicitly as a fruitful approach by Sterner and Hessen , Elser et al. [12–14]; and described in detail in the seminal book of Sterner and Elser . The synthesis written by Sterner and Hessen , which focuses on nutrient limitations of aquatic herbivores, was recognized as a landmark paper that stimulated ecologists to broaden the understanding of producer-consumer interactions while considering ecological stoichiometry . The essential ideas and living-systems characteristics of ecological stoichiometry are as follows: (1) the law of conservation of mass and immutable atoms flowing through the food chain; (2) the capability of living organisms to transform organic substances; (3) stoichiometric stability (“homeostasis”), in which every species has a unique composition of chemical elements in the body tissues, with heterotrophs showing a lower level of variability than autotrophs; and (4) consumer-driven nutrient recycling (CNR), in which the flow of matter through the food chain is regulated by the elemental body composition of species, thereby composing particular links in the chain ([1,16]). Figure 1 The balance of energy and matter affects and is affected by organisms and their interactions in an ecosystem. Figure 2 Consumers that feed on nutritionally poor food (e.g. plant matter) consume a pre-packaged ratio of atoms. For herbivores the food contains more C relative to other atoms, so these organisms must manage a diet with excess C that presents a stoichiometric mismatch that limits their growth and development. The mismatch is further increased by unbalanced relation between non-C elements (exceptional scarcity of some of them). For additional information visit this link, discussing biological stoichiometry and also this link, discussing conservation of mass. Sterner RW, Elser JJ. Ecological Stoichiometry: The Biology of Elements from Molecules to the Biosphere. Ecological stoichiometry: the biology of elements from molecules to the biosphere. Princeton, NJ: Princeton University Press; 2002. Kay AD, Vrede T. Ecological Stoichiomety: Evolutionary and Biochemical Aspects. Encycl Ecol. 2008;1–5: 1472–1481. Vernadskiĭ VI. La Géochimie. Paryż: Alcan; 1924. Smil V. Cycles of Life: Civilization and the Biosphere. New York: Scientific American Library; 2000. Lotka AJ. Elements of Physical Biology. Baltimore, Md, USA: Williams and Wilkins Company; 1925. Tilman D. Resource competition and community structure. Monographs in Population Biology. Princeton, NJ: Princeton University Press; 1982.